Lawn care companies carefully consider charging more. Though many lawn care businesses say the time is right for a price bump (46 percent), just more than half say they’ll hold steady and won’t raise prices this year, according to Landscape Management’s Lawn Care Market Report survey. 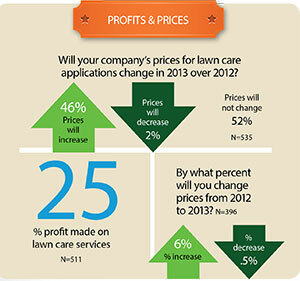 Only 2 percent say they’ll decrease lawn care prices this year (see chart). Those who plan to increase prices will do so about 5 percent, while those who plan to decrease prices will do so less than a percent, according to the survey. Price increases or not, companies report the lawn care application business remains profitable—with respondents to LM’s Lawn Care Market Report survey reporting a 25 percent profit margin on lawn care services. North Chicago, Ill.-based Chalet raised lawn care prices 5 percent for 2013—its first increase in nine years. Likewise, Lawn Dawg, based in Nashua, N.H., instituted its first price increase in a decade—a 5 percent bump. In the Florida panhandle, Banfield’s Lawn Care & Landscaping has not raised prices yet in its three years in business. Lee Kral, lawn service manager for Mountain High Tree, Lawn & Landscape Co., in Lakewood, Colo., also didn’t raise prices this season. Andrew Ziehler, president of Ziehler Lawn and Tree Care in Centerville, Ohio, typically raises prices 2 percent to 4 percent per year, and he did so this year. Q&A: Am I ready to open a new lawn care branch?